This is a hearty meal in one pot with corned beef, cabbage, potatoes, and carrots in a savory broth. Feeds a dozen hungry guests or plan on leftovers. You'll need a heavy-duty pot large enough to hold 4 gallons for this large quantity recipe. Divide onions and carrots and chop enough to fill 1 cup of each, reserving the rest. Place the corned beef in the stockpot. Add the chopped onions, carrots, malt vinegar, stout beer, mustard seeds, coriander seeds, black peppercorns, dill seeds, whole allspice, and bay leaves. Add enough water to cover the corned beef, and stir to combine. Bring to a boil, cover, and simmer about 3 hours until meat is fork-tender. While the corned beef is cooking, cut the reserved onions into eight wedges and the carrots into 2-inch chunks. (Larger carrots should be halved first.) Slice each head of cabbage into 8 wedges. Add onions, carrots, and red potatoes to the cooked corned beef, with the cabbage on top. Cover and return to a boil. Reduce heat and simmer about 20 minutes, until potatoes and cabbage are fork-tender. 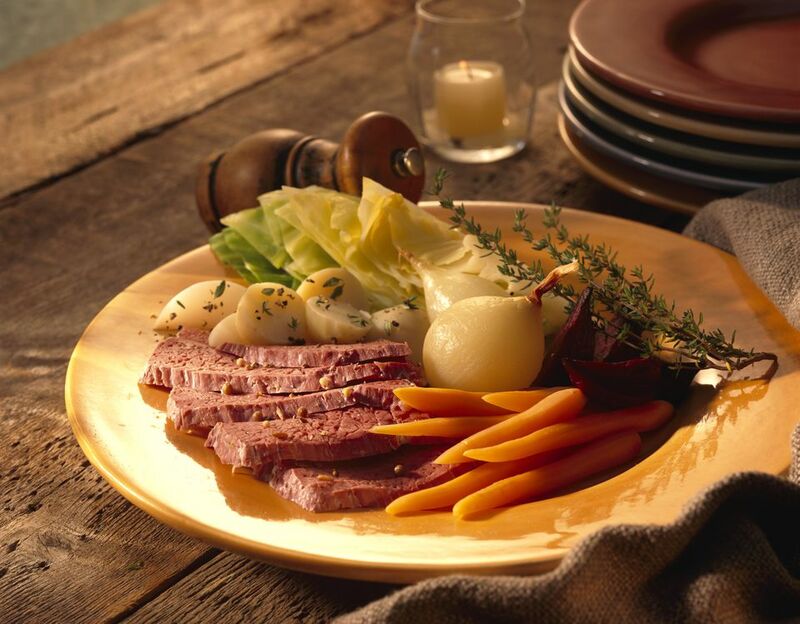 To serve, cut corned beef against the grain into thin slices and accompany with the cooked vegetables. Dijon mustard and/or coarse-grained mustard complement the corned beef as optional condiments.